Spain's defence ministry is investigating after one of its fighter jets accidentally fired a missile over Estonia during a training mission. The incident happened on Tuesday afternoon "in an area of southwest Estonia authorised for this type of exercise", the ministry said. It added that the air-to-air missile did not cause damage and was designed to self-destruct. But Estonia's military says it is looking for the remains of the missile. 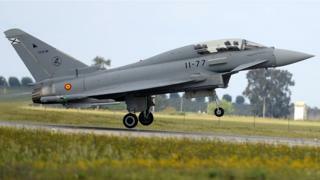 "A Spanish Eurofighter based in Lithuania accidentally fired a missile without causing any harm," Spain's defence ministry said in a statement. "The air-to-air missile has not hit any aircraft. [We] have opened an investigation to clarify the exact cause of the incident." What is the Nato alliance? The missile was reportedly carrying up to 10kg (22lb) of explosives and is thought to have landed 24 miles (40km) north of the Estonian city of Tartu. Two Spanish jets and two French jets were taking part in an exercise as part of Nato's Baltic Air Policing mission when the incident happened. On Wednesday, Nato Secretary General Jens Stoltenberg offered his full support to Estonian Prime Minister Jüri Ratas. "Nato is committed to the defence of all allies and we will continue to safeguard the airspace... in the Baltic region," a spokesperson said in a statement. Image caption Estonian Prime Minister Jüri Ratas said the incident was "extremely regrettable"
Mr Ratas earlier described the incident as "startling" and "extremely regrettable" in a Facebook post. "This is a serious case, and we are very concerned about this. Thank God, no one was known to be injured as a result of the incident," he wrote. He added: "I am sure that the Estonian defence forces will... make every effort to make sure that nothing like this happens again."